The odd time in the past, I have moaned about modern society and the way it is going. There have been some improvements though. Back in the 60s and 70s I collected quite a few records. I tended to go for music that was somewhat outside the mainstream of pop in those days. My collection is therefore very personal and I like it. A few months ago, I started digitising it. It meant hooking a record deck up to an old PC and then warning everyone [Herself] not to go into the room while the tracks were playing, as I didn’t want the needle to jump. That was followed by lengthy sessions with a lump of software to remove all the clicks and scratches. Frankly, I am amazed at the quality of the stuff I produced. Since the days of records [RIP] I have also built up a nice collection of CDs which look rather attractive in their wooden stack. For the last few days, I have been transferring a load of my digitised stuff on to Roger, so that I can play my favourite stuff while driving. Roger is an accommodating bloke as he is quite prepared to beam my music directly into the car sound system. He also has the ability to play just a selected album, or a selected artist, or if I’m feeling lucky, he will just play random tracks from the entire collection. I suddenly realised what I had done. I have transferred the equivalent of 10 LPs onto a yoke that is smaller than a postage stamp. If someone told me forty years ago that I could cram all the music from 10 LPs into a tiny piece of plastic the size of a stamp, I would have said they were insane. So let’s look at the changes in the last forty years. We have lost our freedom, as every aspect of our lives is now monitored, be it by CCTV, computers or databases. We have lost our health service. We have lost the open road, with the proliferation of the car. We have lost respect for those in authority. We have lost the right to determine our own future. We have gained the ability to balance ten long playing records on our fingertips. I think that’s a fair trade? We lost our respect for those in authority when they took away the right to determine our own future. We gave away our freedom, as every aspect of our lives is now monitored, be it by CCTV, computers or databases, when we didn’t throw put those in authority for proposing the monitoring. Jim C – Same difference! 😉 The mini chip makes up for it all though? I personally would welcome the typewriter and the rotary phone in exchange for our freedoms. I have 285 songs copied to my phone. Brianf – What freedoms? Homeland Security? ?? Hmm, musing on the day Grandads brain can be digitised, downloaded, syndicated, backed up, restored, shared, archived, digged, pinged, buzzed up, rss(ed), and attached to an email list! I too have a substantial collection of vinyl records, but unfortunately they’re all destroyed from being flung around at parties. Grandad check out ‘Dogbaits Babble’ His blog today reminded me so much of you i told him to check you out, he admired your style so much he is putting you on his blogroll.He’s in S Australia. Mick – “musing on the day Grandads brain can be digitised, downloaded, syndicated, backed up, restored, shared, archived, digged, pinged, buzzed up, rss(ed), and attached to an email list” The day you do that is the day you will find a 12-bore rammed up your arse. June – Nice one! The least you could do is give the Poor Sod a link? 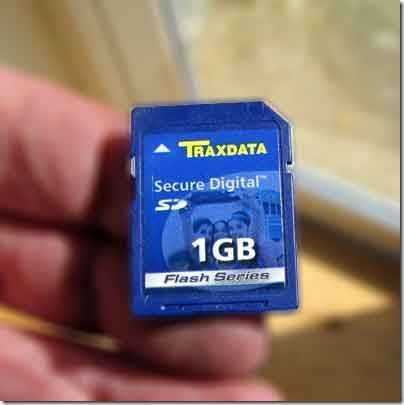 Now up to 32GBs in capacity and only ¼ the size of a postage stamp! 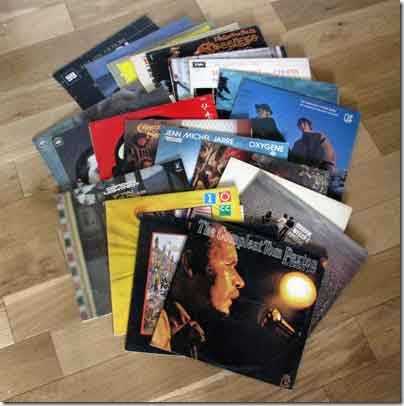 Oh its all a bit too deep for me – I don’t recognise the record sleeves Grandad – what music were you into????? Neighbour – Now we are getting deep. One of these days I will delve into my murky thoughts on how our rights are merely an illusion. Kate – An eclectic mix. If you look closely there, you will find Simon & Garfunkle, Steeleye Span, 10cc, Tom Paxton, Gordon Lightfoot, Marvin Welsh and Farrer, Fantasia Lindum and even a couple of classical disks. We saw a band on Saturday that did a fair rendition of 10cc, steeleye span, cat stevens, the stones, moody blues et al… it was great!! I don’t see my favourite album in your collection – the Basil Brush LP. Kate – Faithful, Black Eyes, Tiny Robin? They’re all up there! I think I have their entire collection still, and certainly have most of it digitised. You can’t beat the old [real] music. Well done Grandad – I can’t stop singing it now – the only tune in my head last night and again this morning is Faithful – I can only hope that ‘all too soon she’ll be gone beyond the horizon’ tra la! Sighs – There is nothing to stop you having the odd toke? Or are you afraid of setting the straw on fire? Perhaps I am just very old-fashioned, but I am happy enough with CDs. In my younger years, when I worked regularly for radio, I had a collection of more than 2000 records (LPs & singles), and then that was the way to have music. Then the CD arrived, and it is in many ways – but not in every way – quite an improvement. Though I am fully aware of MP3 and all the other new ways of storing music on computers and other electronic gadgets, I never have been much attracted to that. My computer is a work tool, and not a music box. And when I want to listen to music, I can put a CD into the player and still use the computer in the normal way. But I agree with you on the summary you gave: We have lost most of the important things over the past 40-50 year, and especially our freedom. But how did it come to that? Simply because too many people do no longer care for the important things and have been turned by vested interests into brainless and opinion-less consumers. They are no longer active citizens, who take an interest in their community and planet. No TD walks into Leinster House by himself, and the same goes for all the politicians in other democratic countries. The people elect them and send them to parliament. They also decide what to do with their time and their money, what to buy and how to behave. Although the two of us, and a number of others, might not have actively participated in the collective demolition of freedom and common sense, we were also not able to stop the hordes of morons around us from doing it. So now all we are left with is a ruined country, on a ruined and polluted planet, with most of the money in the wrong hands and most people still remaining docile. And to keep them even more docile, the people with vested interests produce all these gadgets we are supposed to use for ‘entertainment’, so we won’t be thinking of the really important matters. Actually, I have been close to the point of giving up the internet and go back to books only. But blogs like yours, as well as my own humble one, keep me here and active. However, I am living already for many years without TV and have not used a commercial aeroplane in over 20 years. Unfortunately hardly anyone else follows my example, and as I am no missionary preacher or demagogue, most people don’t even know. So be it. All I can hope for now is that the generations that come after us will at some stage be able to re-discover the true values we have lost, and in particular the value of freedom. Emerald – That is quite a comment! I can feel another rant coming on, but I think I’ll let the gall rise a bit before writing it! !